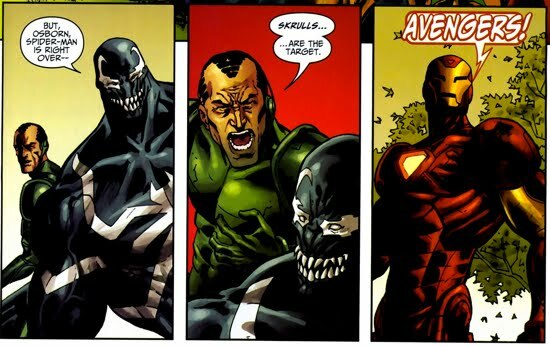 Norman Osborn's Thunderbolts had recently suffered a handful of defeats. The first, from a group of telepaths who were imprisoned at Thunderbolts mountain and had manipulated the team into attacking one another. The second being their failure to apprehend the Spider-Tracer killer when Randall Crowne solicited their help during New Ways to Die. The Thunderbolts also failed to capture the vigilante Moon Knight during the Death of Marc Spector story arc. Norman has been repeatedly forced to put positive spins on these questionable Thunderbolt results, a tactic that cannot last forever. However, opportunities for redemption would soon be presented to the team in the form of a secret Skrull invasion that was about to become a full-fledged attack on Earth. This invasion has led to mutual super hero mistrust as some of the heroes have been replaced by Skrulls and no one knows for sure who's who anymore. The Thunderbolts actions during this Secret Invasion are detailed in Thunderbolts #122-125 in a four part story arc called Running the Asylum. 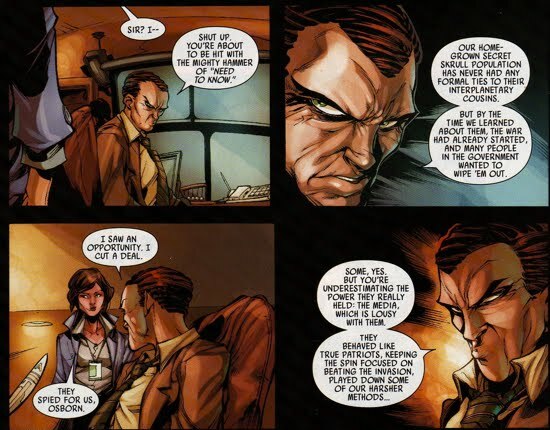 The ramifications of this story arc will change Norman Osborn's status in the Marvel Universe immensely. 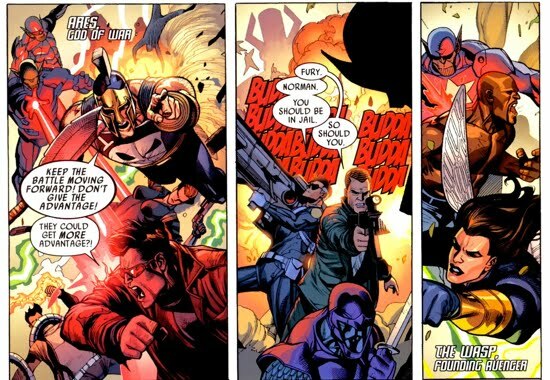 In Thunderbolts #122, the team is still recovering from the telepathic takeover they had just fallen victim to. Songbird has been named the new field leader, and she is convinced that Osborn and Moonstone are in some way responsible for the death of her mother. 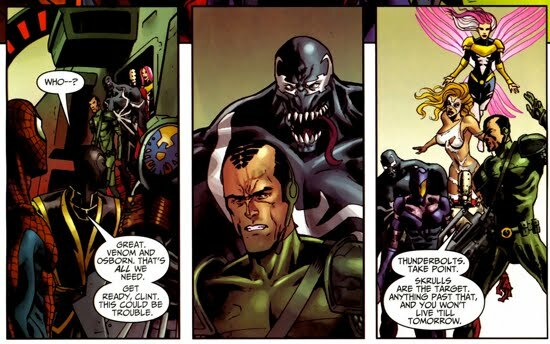 This is a rather reasonable assumption considering the events of Thunderbolts: Breaking Point. Later, when the team is struggling to corral the villain Swarm, Norman forces a "mentally deteroriating" Venom to handle the situation. Venom is able to subdue Swarm after eating the insects which comprise the villain. Soon after, the Swordsman’s sister Andrea, who was supposedly dead, mysteriously arrives at Thunderbolts Mountain. Arnim Zola is immediately suspected as the one responsible for her sudden appearance, but the Swordsman denies any contact with the known bioengineer. Suddenly, Captain Marvel (aka Mar-Vell) comes crashing into Norman’s office while Osborn is talking to Moonstone, Songbird, and Swordsman. 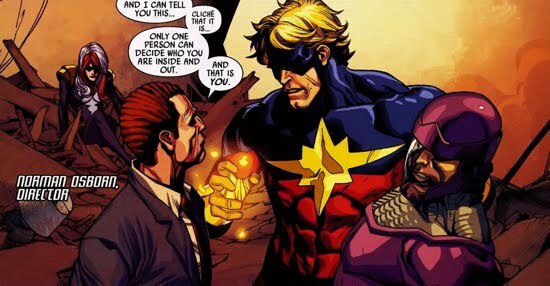 After Captain Marvel neutralizes the entire team by absorbing energy from Radioactive Man, Osborn calmly requests that Captain Marvel sit and discuss this with him over a drink. This scene is also depicted in Secret Invasion #1 and Secret Invasion #3. The Skrulls then release their Super Skrulls on the team since Captian Marvel failed to kill them. Radioactive Man becomes unstable approaching critical mass, while Penance and Norman begin suffering from hallucinations. Norman is surrounded by a half dozen Spider-Men. In a memorable scene at the beginning of Thunderbolts #124, Norman continues to battle the slew of Spider-Men. Norman’s hallucinations were in fact real, and the Spider-Men were Skrulls, which he destroys easily, referring to the slaughtering as "surprisingly therapeutic." Later, Moonstone plots to conspire with Skrulls to save herself in exchange for ruling over South America. But this plan backfires when Swordsman’s sister, who is revealed to not be Skrull, attacks Moonstone for being a traitor. Bullseye then kills Swordsman’s sister, as well as his handlers and basically anybody else that he had felt like killing. Moonstone and Radioactive Man blow up a Skrull ship in space using a nuclear blast fueled by Chen’s instability. 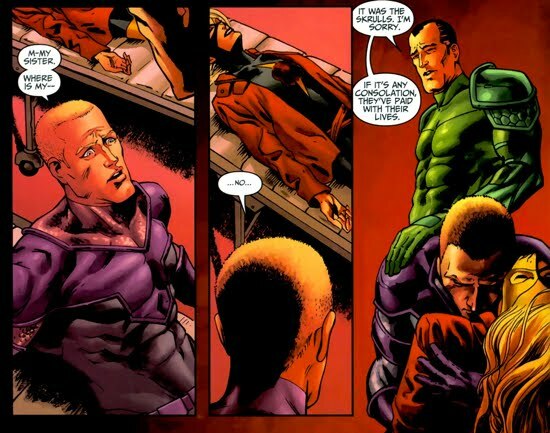 Osborn tells Swordsman that it was the Skrulls that killed his twin sister, even though Osborn is aware of the truth. 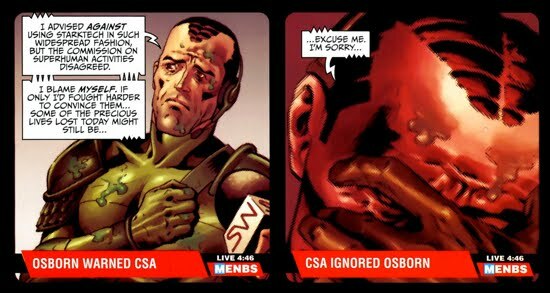 This causes Swordsman to swear vengeance upon the Skrulls, as he was manipulated perfectly by Osborn With a group of journalists/reports standing by Norman commands his team to stand up and fight for their country, for his country. The final chapter of this arc is featured in Thunderbolts #125. After successfully thwarting the Skrulls attack on D.C., Norman Osborn is now being featured on the news downtalking Starktech and the vulnerabilities it created with its ubiquitous usage. He claims to have advised the C.S.A. against that strategy. He also states that after ensuring the President’s safety, the Thunderbolts will now go wherever they are needed. The Thunderbolts head for ground zero, Manhattan. Bullseye takes out a giant sized Hank Pym Skrull using a rocket launcher, he initially had the sights set on Spider-Man and Daredevil. 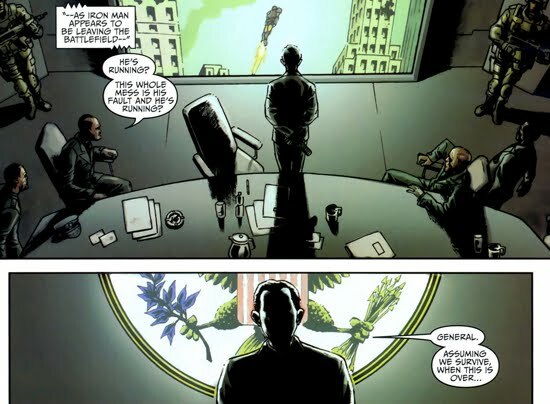 Norman watches Iron Man leave the conflict due to his faulty equipment, and he sees this as the perfect opportunity for the Thunderbolts to take the frontline of the battle field. 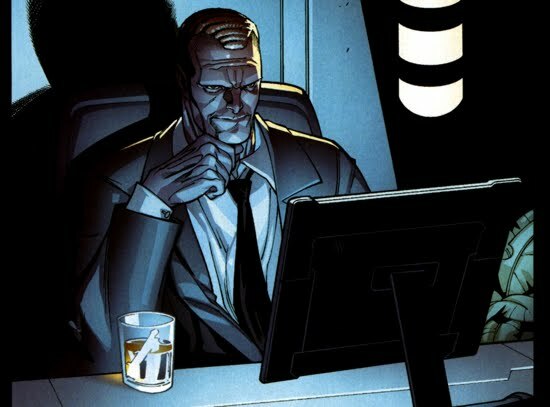 The President is watching all of this and states that if/when we survive this attack, he wants Norman Osborn brought to see him. Norman's public displays of grief and despair toward the invasion were not the only tactics that he was employing to undermine the efforts of Tony Stark and the Avengers. While Osborn and his Thunderbolt team waged a war against the Skrulls that the whole world watched, Norman secretly made moves to guarantee himself a victory. Nick Fury had hired Deadpool to steal a large amount of Skrull data in order to help Fury thwart their invasion. Deadpool was successful at stealing the data, but when he tried to send it to Fury, Norman intercepted it in Deadpool (V2) #3. Deadpool would later try to exact his revenge upon Norman after Norman took over the Avengers and Osborn preempted his attack by sending the villain Tiger Shark to kill him. It is unclear how Norman utilized the data to defeat the Skrulls, largely because he used only a shotgun to kill the Skrull Queen Veranke. During the invasion Norman boasted that his Osborn Tech was superior to Starktech, so it is possible that he supplemented his systems using this data. That's speculative though, again, the exact mechanism behind how the data helped Norman remains unknown. Interestingly, it was later revealed that Norman's theft of Fury's data was not the only covert plan he'd set into motion during the Skrull's attack. 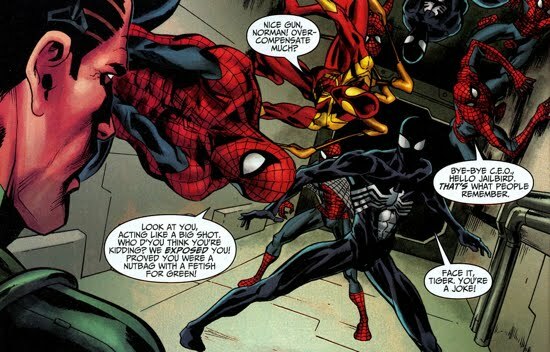 In Dark Reign Skrull Kill Krew #5, Norman admitted to his H.A.M.M.E.R. agent Viola Reichardt that he'd cut a deal with the 'home-grown secret Skrull population' during the invasion. Because of the hostility between humans and Skrulls brought on by the invasion, the U.S. Government wanted all domestic Skrulls wiped out. However, Osborn's deal with the Skrulls spared their lives and in exchange the terrestrial-Skrulls aided the human resistance. These Skrulls acted as spies for Osborn and also utilized their influence with the media to down-play some of the harsh tactics Norman and his team used to defeat their enemy. After the dust settled from the invasion and the home-grown Skrulls wanted their just due, Norman had to pony up. His dealings with the Skrulls as the director of H.A.M.M.E.R. can be found here. Norman's masterfully crafted plan reaches it pinnacle in Secret Invasion #8, which is outlined in the next section. Some things worthy of note. 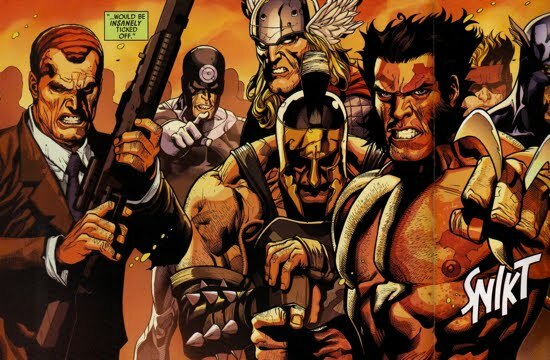 The repitition of scenes displayed in both the Thunderbolts and Secret Invasion provided the readers with a definitive timeline in which the Thunderbolts actions had occurred. These interwoven scenes led to a flaw in the story's presentation, namely with Norman's wardrobe. 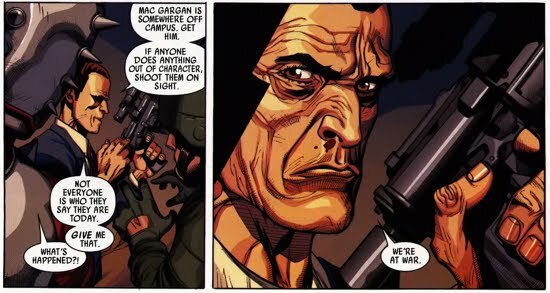 His attire in the Thunderbolts books was resembled an army commando, while in the Secret Invasion series he fought on the front lines in his suit and tie. The former is certainly more believable, however, his infamous "shot heard round the world" on the Skrull Queen is not in sync with rest of the events that got him into that position. The Thunderbolts held an extreme advantage against the Skrull attack, their lack of Starktech kept them free of the Skrull's preemptive viral attack on the ubiquitous technology. 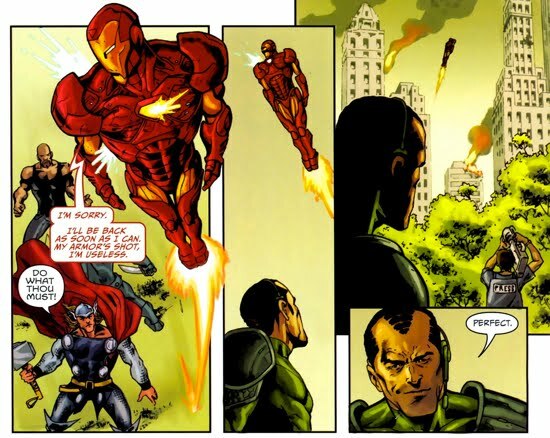 With Iron Man fleeing the battle because of his compromised armor, Norman Osborn ceases the opportunity to become the new face of Earth's resistance to this Skrull infiltration. In Secret Invasion #8, with the entire world watching, Norman Osborn delivers the kill shot on the Skrull Queen, who is disguised as Spider-Woman. Soon after, S.H.I.E.L.D. is shut down, and during a nationwide speech it is announced that a “certain type of man is needed at the head of the table”. 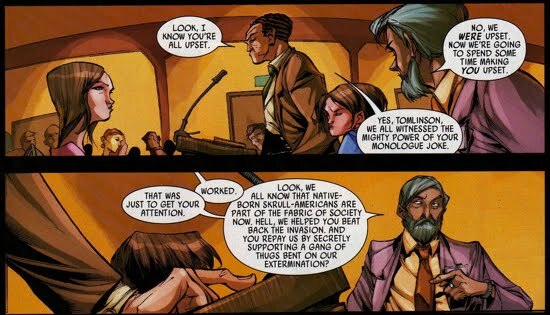 That man is Norman Osborn. 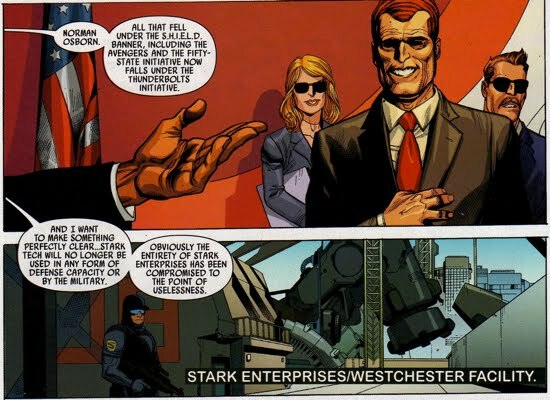 All that fell under S.H.I.E.L.D.’s jurisdiction, that includes the Fifty State Initiative and the Avengers, is now under Norman Osborn and the Thunderbolts Initiative. At the story’s conclusion, Norman gathers Emma Frost, Doctor Doom, Namor, the Hood, and Loki as he begins to lay out his plans for the future. The Dark Reign has begun.